Health and Beauty Girl : Sign Up To Receive FREE Sensitive Skin, Hair & Body Care Products | Launching Soon! Sign Up To Receive FREE Sensitive Skin, Hair & Body Care Products | Launching Soon! Who doesn't love getting FREE products to try out!? 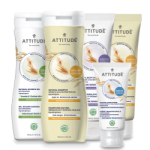 ATTITUDE is coming out with a new sensitive skin, hair and body care line and they're offering free products to sample! New Sensitive Skin Collection from ATTITUDE coming soon!!! They are plant-based, #natural, #vegan, #hypoallergenic, #ewgverified and dermatologist tested. Get an early online access and up to a full year of FREE shampoo! Be among the first to try out these new products: SIGN UP HERE! Submission for this campaign are now closed! I hope you got in! referral link to sign up. everyone receives one when signing up.